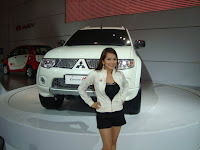 2nd Batch Photos to the 2nd Philippine International Motor Show (PIMS) last August 21-24, 2008. I love cars... especially the people beside them, hehe. The girl in the white jacket gave a different view in my personal and humble opinion. Makes me wanna buy a car from her. wink wink. Check the other girls inside. Lots of them actually. Check also the 1st Batch of PIMS Car Show.